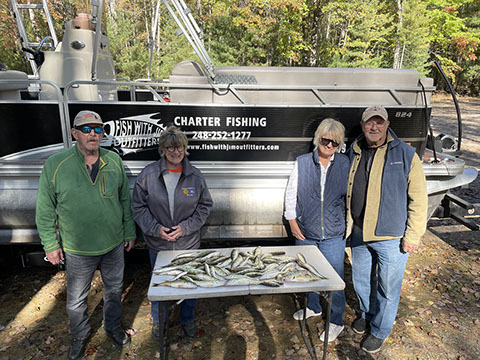 Featured by the Detroit Free Press, Fish With Jim Outfitters organizes expertly guided fishing trips in Steelhead Alley both on Lake Erie and its Tributaries. Strap-on your waders and walk into some of the most productive Steelhead Rivers that Northwest Pennsylvania and Northeast Ohio has to offer. Enjoy fishing Conneaut Creek, Ashtabula River, Elk Creek, Walnut Creek, The Mile Creeks and many other Secret Creeks. We provide you with float fishing tackle with both center pin and spinning rods. The Steelhead Alley streams are the perfect backdrop for an action packed fishing adventure! They have incredible scenery with 100-foot cliffs of shale and sandstone, waterfalls and all types of wildlife for all to enjoy. Waders are required for this trip. Booking your Walk and Wade Steelhead Alley trip with Fish With Jim Outfitters ensures that you will be in the best possible water and using the right fish catching technique to have a successful day. Because rainfall and river levels vary year to year Fish With Jim Outfitters selects the river for your trip two days prior to your date. It is not uncommon to catch Steelhead over 10 lbs. To be successful in Steelhead Alley you can never have enough tools! Fish With Jim Outfitters offers trips from our 18' Starcraft Freedom the perfect option for crowded weekends and if the fish haven't run the river. When fishing the Lake Erie Shoreline and Pier heads our guides use many fish catching techniques that are proven to put fish in the boat. Troll using crankbaits and spoons with high quality rods from G Loomis and Shimano Tekota line counter reels. Run up the river and float fish with custom spinning rods from Jim Smith Custom Tackle and Okuma Reels. Booking your trip with Fish With Jim Outfitters ensures that you will be in the best possible water and using the right fish catching technique to have a successful day. Pennsylvania Stocks over 1.2 Million (London strain) and Ohio stocks over 450,00 (Manistee strain) Steelhead that begin to migrate to the Lake Erie Tributary streams at the end of September and can be caught through April. Averaging 24 inches in length and weighing 6 – 10 lbs., Steelhead fishing is an exciting game for anglers of all experience levels. Come fishing among breathtaking natural scenery and wildlife such as deer and bald eagles, with a chance to take home up to two trout in Ohio and three trout in Pennsylvania. Elk Creek is the largest and most popular of the Erie County tributary streams. It enters Lake Erie about one-half mile west of State Route 18 in Girard Township. Elk starts south of the Town of McKean. It flows under Interstate 79 at the McKean, under West Road in the Village of Sterrettania, under State Route 98 at Folly's End Campground south of the Town of Fairview, under a scenic covered bridge on Gudgeonville Road, then northwest through a mostly wooded area passing under Interstate 90, then north under U.S. Route 20 in Girard and under U.S. Route 5 in Lake City and on to Lake Erie. Walnut Creek is the second largest and second most popular creek for steelhead fishing. Walnut begins south of the Millcreek Mall. It flows northwest through Millcreek Township, north through Fairview Township and enters Lake Erie east of the town of Fairview. The Mile Creeks are located east of Erie Pennsylvania and range from small to medium in size. Each of the streams offer great mouth fisheries. These areas are primarily fished in high water conditions. Conneaut Creek is a 43.5-mile tributary of Lake Erie in northwestern Pennsylvania and northeastern Ohio. Conneaut Creek rises in western Crawford County, Pennsylvania, and initially flows north-northwestwardly past Conneautville into western Erie County. Near Albion, it turns to the west-southwest and roughly parallels the shoreline of Lake Erie for some length, at a distance of about 5 mi (8 km) inland, into northeastern Ashtabula County, Ohio, where, at Kingsville, it turns to the northeast to flow into Lake Erie at the city of Conneaut. Fish With Jim Outfitters knowledge of the Steelhead Alley Streams will guarantee that you will be in the best possible water on the day of your trip. We specialize in finding "out of the way" places that are not crowded. We are available seven days a week during our season. Call 248-252-1277 for details. Boat trips are offered in both OH and PA waters are based on lake conditions. Both 4 and 7 hour trips are available. Fishing License: Please consult with your guide prior to purchasing your fishing license. PA Fishing License: Anglers 16 and older are required to have a Pennsylvania Fishing License. 1-Day Tourist - $26.70 (includes Combination Trout-Salmon/Lake Erie Permit $15.70), For your convenience please visit http://fishandboat.com/license.htm to obtain your fishing license. OH Fishing License: You will be able to purchase an Ohio Fishing License for $11 daily, three-day for $18, Resident Annual for $19 or Non-Resident Annual for $40. For your convenience please visit https://www1.oh.wildlifelicense.com/start.php to obtain your fishing license. Directions: All trips meet at The Green Roof Inn. Please meet us a half hour prior to your scheduled time. Steelhead Tackle: All bait and tackle is provided at no extra cost. Waders: For your comfort, we recommend a breathable stocking foot wader with studded boots. Any other wader will work but will compromise your comfort and safety as the creek bottoms are very slippery. Keeping Fish: You are able to keep (3) Steelhead or Trout over 15 inches per person in PA and (2) Steelhead or Trout over 12 inches per person in Ohio. Fish Cleaning: Fish With Jim Outfitters offers fish cleaning to our customers for a fee of $2 per fish. We provide bags for your catch. What To Bring: We recommend you bring the following items to make your trip as enjoyable as possible; bottled water or soft drinks (no alcoholic beverages are allowed), a rain jacket, polarized sunglasses, hat, sunscreen, camera and a cooler for your catch. We fish a variety of conditions so please dress for the occasion. Gratuity: Please remember your guide at the end of the day. A normal tip is 15% of the total value of your trip.